It’s natural for kids to experience anxiety when faced with new or stressful situations. So how do you know when it’s become social anxiety disorder? It’s common for kids to feel nervous or anxious in social situations. With some reassurance and guidance most kids learn to cope with these feelings and overcome them. 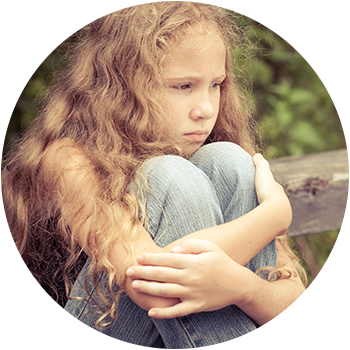 However for a child who is experiencing social anxiety disorder, these fears and worries are extreme and persistent. What might a child with social anxiety be thinking? The underlying fear causing social anxiety is usually related to a belief that something bad will happen. For example, a child may think “I might say something stupid and people will stop liking me”. Even if a reassuring parent or adult tells them not to worry, the thought or belief won’t go away. In order to cope with the anxiety, a child might act in ways that make things worse in the long run. Supporting a child experiencing social anxiety can be challenging and it’s important to take care of yourself and seek support when you need it. If social anxiety is impacting your child’s quality of life, you can talk through options with your local doctor. If you child needs support to manage anxiety they can also call Kids Helpline and talk with a counsellor. If you need some support and guidance on how to cope with and help your child manage their anxiety, give us a call on 1300 30 1300 (QLD & NT) and speak to one of our trained counsellors.